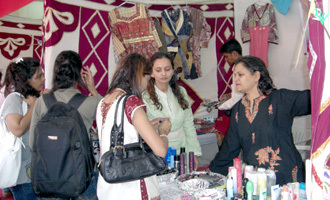 As part of the 2 Decades Celebration, MET League of Colleges held MET MELA on March 18, 2009 at the MET grounds. This event was well attended by over 2500 students, academicians, staff and corporates. Lighting of the traditional lamp by Trustee, marked the inauguration of the MET Mela. This set the mood for the excitement to follow. Captivating dances on Rajasthan, Gujarat and Malvan backed by folk music items were performed by MET staff and students.